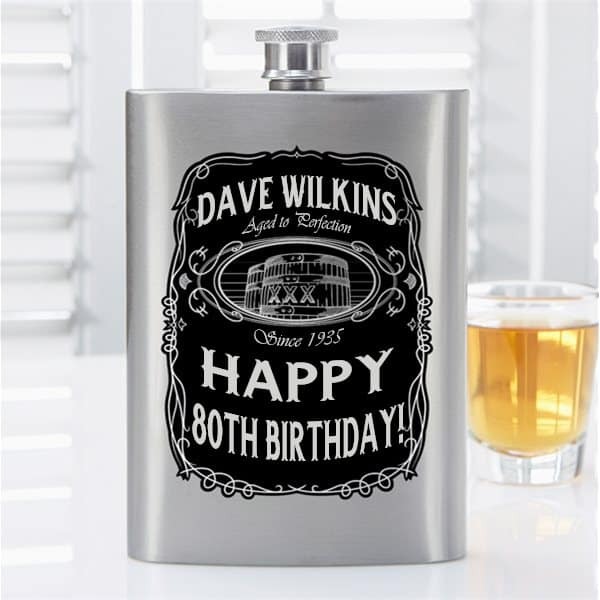 Looking for 80th birthday gift ideas for Dad? Check out our guide to the top 33 gifts! 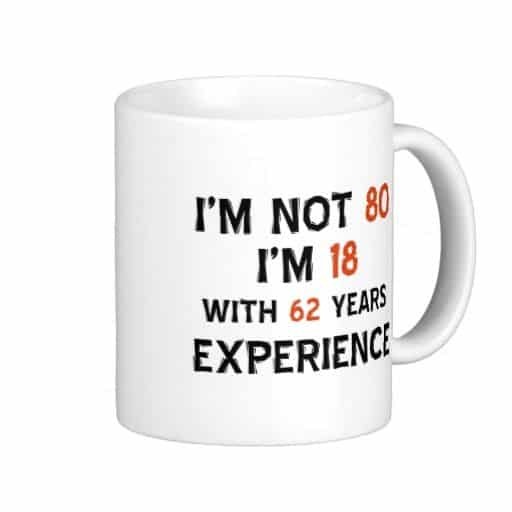 Our best-selling 80th birthday gift! This fabulous present is sure to be one of the highlights of Dad’s birthday. 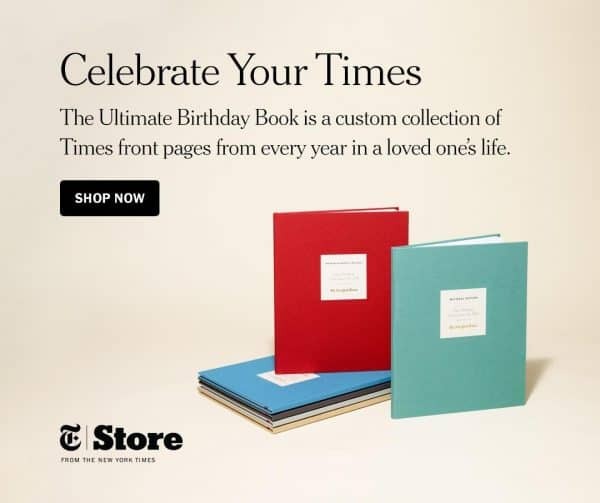 Handsome book features every NY Times front page birthday edition for his entire life – 80 years of memories and historical events in one unique gift. Hardbound book is available in your choice of 7 colors and 2 cover styles. It is personalized with Dad's name and birthdate on the front. Packed with approximately 140 pages, the souvenir book includes an exclusive photo-filled 20 page timeline, as well as additional headline pages from around the world. Dad will be amazed to see what events he remembers – and shocked at the ones that he might have forgotten! This unique milestone birthday gift is the perfect choice for the Dad who has everything! Handsome print features his name and birth date at the top. Underneath he’ll find a wealth of trivia about popular events and news headlines from the day that he was born. It also features a cost-of-living comparison of common items between today’s prices and the prices then. Mark Dad’s milestone birthday with an elegant gift basket full of delightful treats! My top pick for birthday gift baskets is GiftTree. 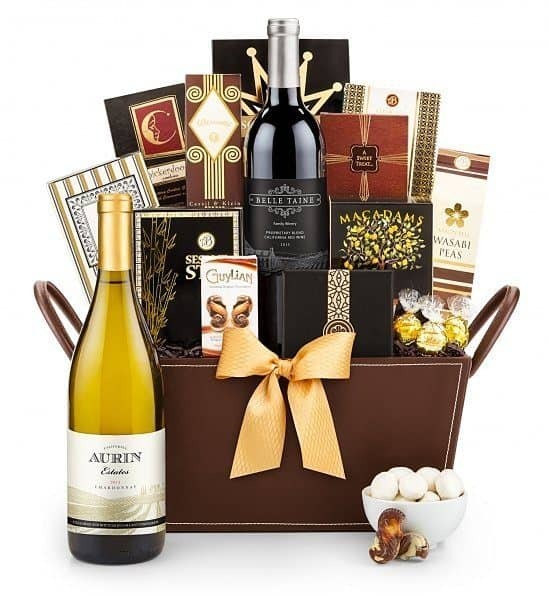 They have an extraordinary selection of gift baskets that are sure to delight – with prices starting at under $30. From cheerful happy birthday cookie buckets to divine wine gift baskets to over-the-top, extravagant gift baskets, they do it all with style. For a special touch, look for the option to add a personalized ribbon to Dad’s gift basket…he’ll appreciate the loving message! Leather-bound book asks all those thought-provoking questions that will allow your Dad to reflect upon and record his values, experiences and memories. The book features around 500 questions that range from simple to thought-provoking. It also includes a family tree section and blank pages for mementos. 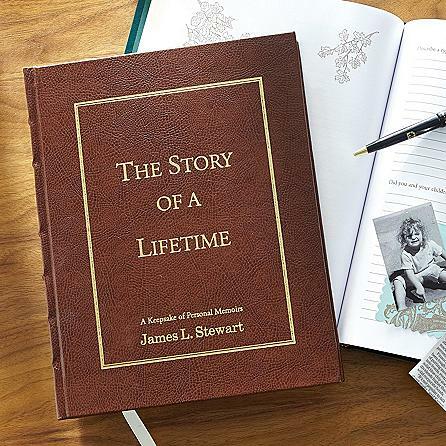 He’ll have a wonderful time reminiscing about his life, and the book is a wonderful way for your Dad to share his life stories with future generations. 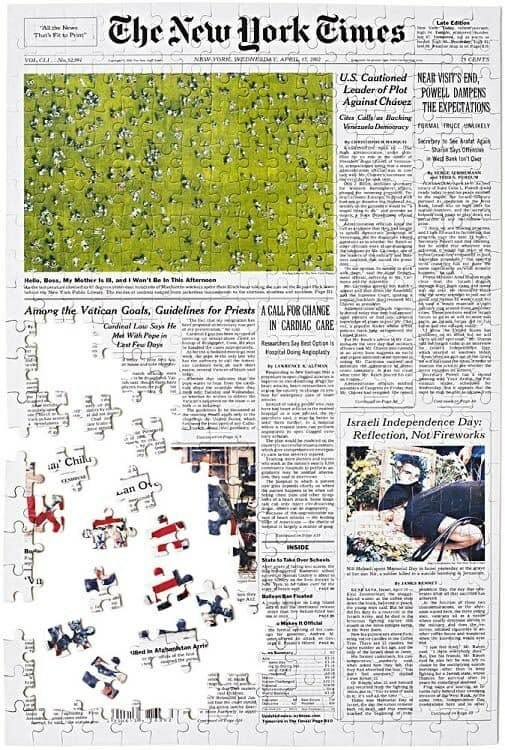 Made to order jigsaw puzzle (available in 3 sizes) features an exact reproduction of the New York Times front page from the day he was born. It comes complete with a high-quality reproduction of the front page to serve as a reference point when assembling the puzzle. Hopefully Dad has a sense of humor about turning 80. If so, a funny coffee mug is a great gift – priced at under $25. A wonderful stand-alone gift, or you could use it as the base of a small gift basket full of Dad’s favorite coffee and treats. A stylish and meaningful addition to his home decor, this exquisite keepsake features your choice of 7 touching poems, and if you have a way with words, you can even publish your own composition. Laser engraved onto a transparent block of shimmering lucite, the poem is followed by your closing sentiment and name for a love letter that he’ll never forget. For the dad who appreciates history and his daily newspaper, this hardbound keepsake is an excellent way to celebrate his 80th birthday. 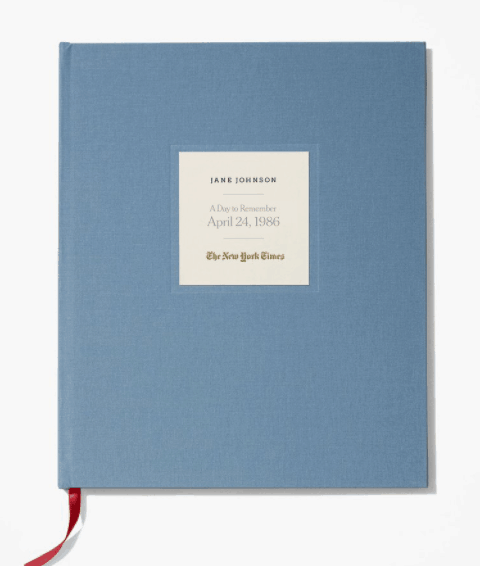 Featuring the full The New York Times reprint from his birthdate, this gift lets him step back in time to see what the world was like on the day he was born. Personalized and stamped with his name and date of birth, it will make a priceless addition to his book collection. At 80 years old, your dad is sure to have enjoyed years of travels, memories and unforgettable places that he’d love to relive with friends and family. 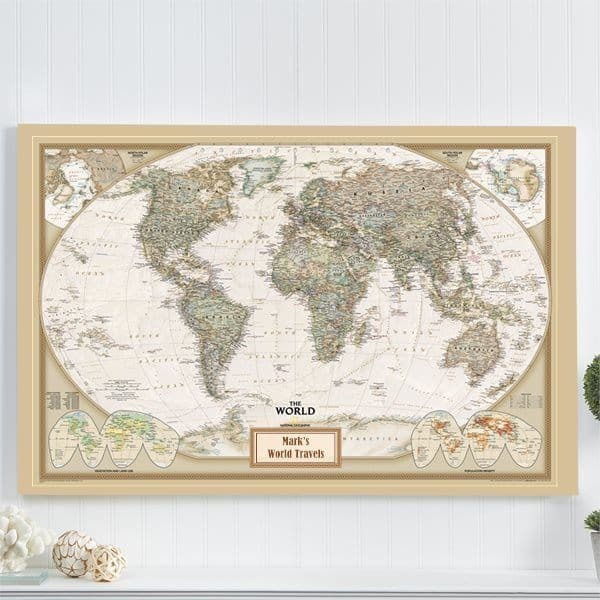 With this beautifully framed and personalized map, you can help him do just that. Including 100 colorful push pins, this gift lets Dad map out his memories from past road trips, exotic vacations, romantic getaways and more. He can even pinpoint the locations of loved ones to show that the distance between them really isn’t too far. Click﻿﻿ ﻿﻿here to see the US version of Pin Your Journey Map. This fun pillow is a comfortable way to remind Dad how awesome you think he is! 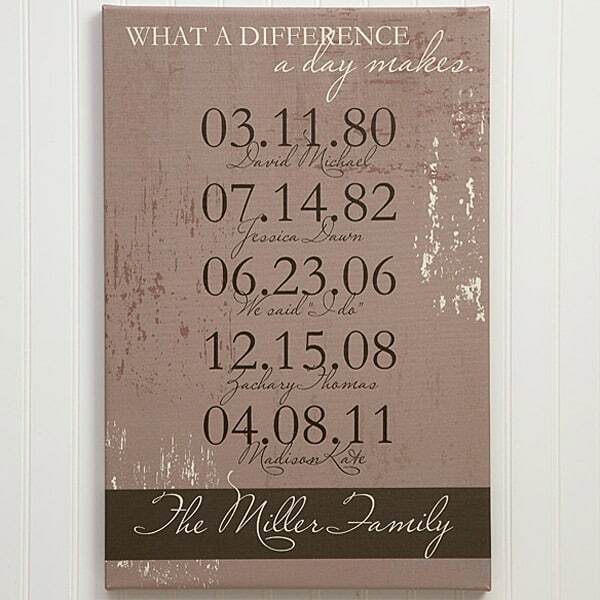 Available in 3 different sizes and shapes, you can personalize this with Dad’s name. You can also change the background color of the pillow if you’d like. A major celebration such as an 80th birthday deserves to be toasted, so why not treat Dad to a champagne gift basket? 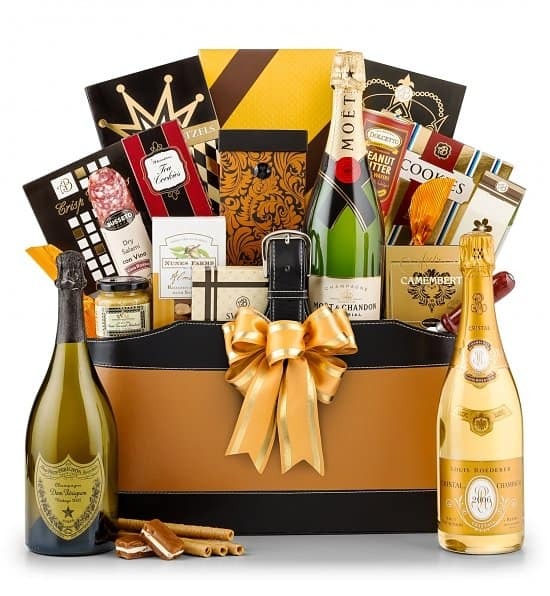 GiftTree offers an amazing selection of champagne gifts and champagne gift baskets. Prices range from under $50 for a Personalized Champagne Wooden Crate to over $700 for a Cristal and Caviar Ultimate Experience. You can add a personalized Happy 80th Birthday ribbon to many of their gift baskets – an extra touch that Dad is sure to appreciate! If Dad’s a beer-lover, this is a marvelous (and affordable gift) to commemorate his special birthday! Priced at under $35, this impressive oversized beer mug is deep etched with his age and any 2 lines of personalization. His beer will taste oh-so-much-better when he enjoys it from his own personalized mug! 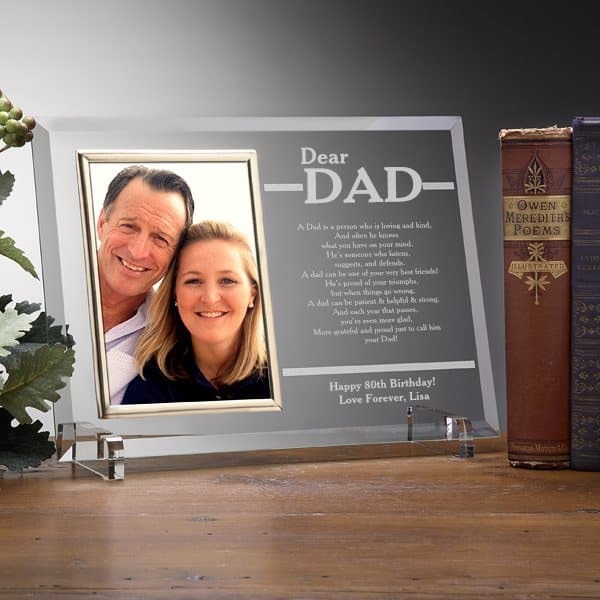 If you’ve ever wanted to pen and preserve a loving message to Dad, here’s your chance with this elegant glass frame. Acting as a 3-D letter, it includes any title followed by an original poem or your choice of a pre-existing one. End your moving message with any closing sentiment and names, which are laser-engraved to produce a dazzling transparent mirage. Featuring beveled edges with golden brass accents, it is a truly stunning piece that will brighten any room as well as his day. If your dad is quite the fisherman, he’ll love this personalized fishing lure, which lets him know that he’s your favorite catch. Customizable in 3 colors, it includes 2 lines of personalization. 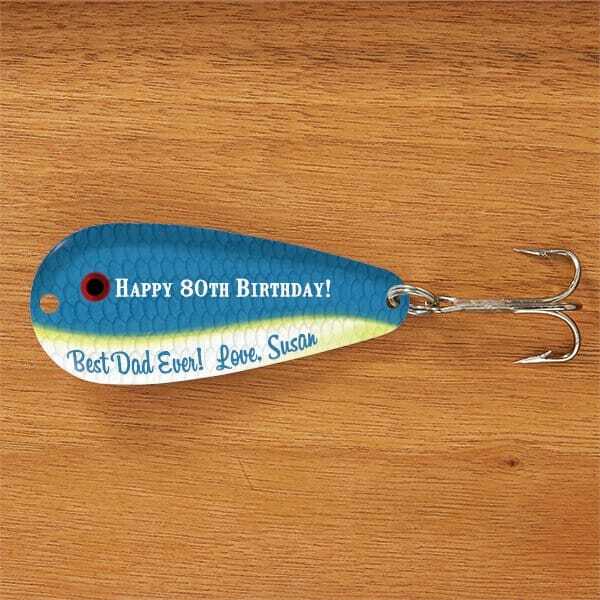 The perfect 80th birthday gift for the Dad who loves fishing! 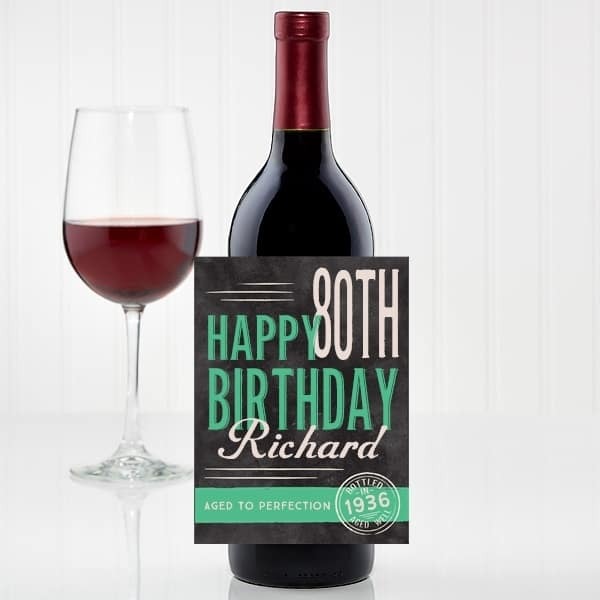 For his 80th birthday, treat Dad to his favorite (or a long dreamed-of) bottle of wine - and make it even more special with a personalized wine bottle label! Just remove the old label, and peel and stick the personalized label to create a memorable birthday gift for Dad! 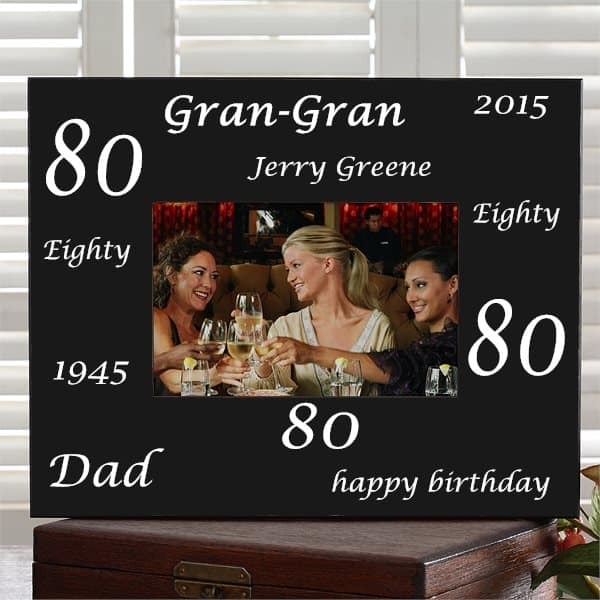 This striking personalized frame is a fabulous way to show off a treasured picture from his 80th birthday celebration! 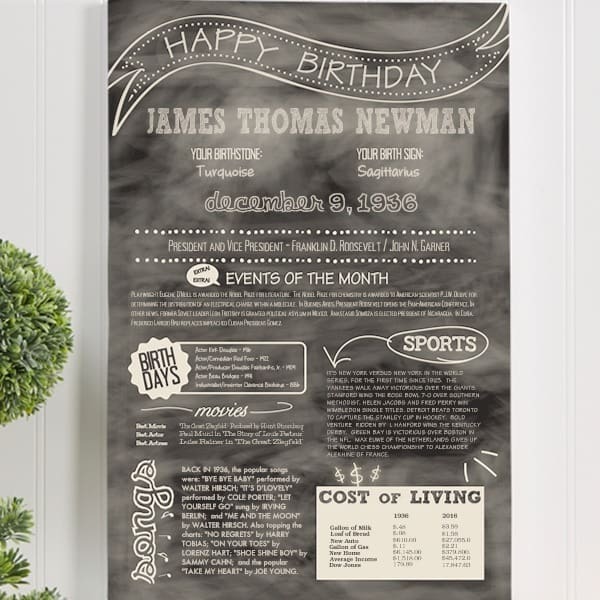 Available in your choice of 6 colors, it features Dad’s birthday year, the year he was born, and 3 additional personalized fields for nick-names or other messages. You’ll take loads of photos on Dad’s special day – and this handsome wooden photo album gives him the perfect way to preserve those precious memories! Choose from 2 designs, then have Dad’s name and birthday laser-engraved on the front. Reminiscent of the era of his youth, this silver-plated timepiece can be personalized with his initials for a look that is all his own. 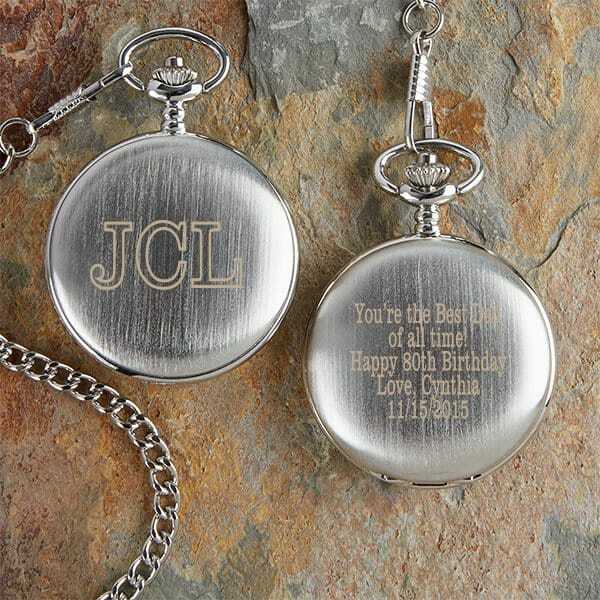 Onto the stainless steel back, you can engrave any 5-line message for a gift that proclaims your love around the clock. Its brushed metal texture and dependable quartz movement make this a keepsake that is both functional and stylish. At 80 years old, Dad certainly has plenty of loved ones that he’d love to share with the world. With this customized super-soft fleece blanket, you can help him do just that while providing him with an ultra-soft and comfortable gift that he can wrap up in at home or out at a sporting event. 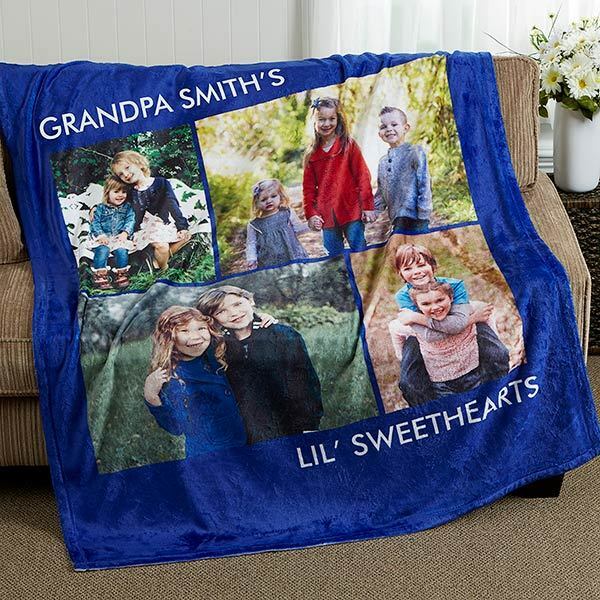 Available in 2 sizes and 6 colors, you can personalize this cozy, generously sized blanket with 2 lines of text and up to 6 of your favorite photos. For the dad who still enjoys his favorite drink, this personalized flask features a vintage design he’s sure to love. Composed of stainless steel, it can be customized with his name and a 4-line message of your choice. Holding a generous 8 ounces, he can enjoy his beverage in style and toast to many more birthdays to come. An 80th birthday presents the perfect opportunity to celebrate the beloved family that Dad established. 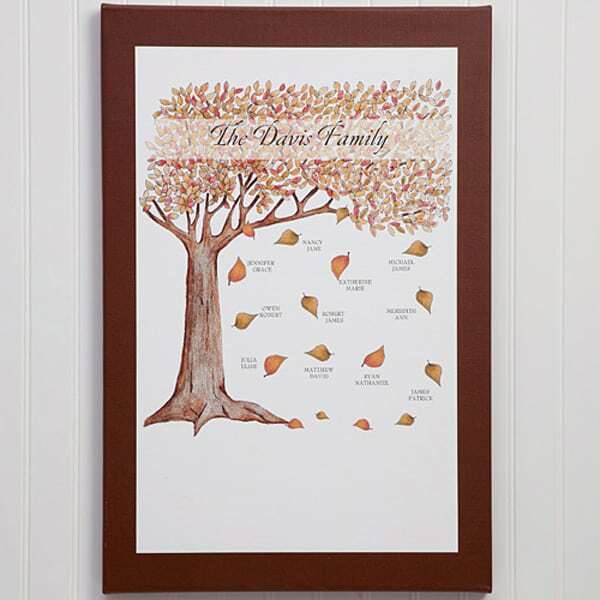 With a family tree as big as his personality, this watercolor print features your family name within the treetop and up to 18 names below, each accompanying a falling leaf. Crafted onto museum-grade canvas with archival inks, this professional piece comes gallery wrapped and ready for display. Most milestone events in life require new clothes. 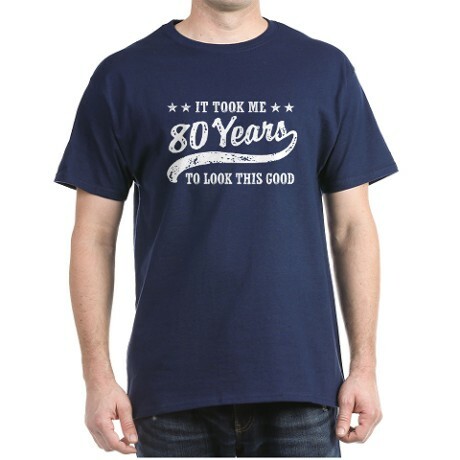 For an 80th birthday, Dad should kick back and relax in a comfortable 80th birthday shirt. 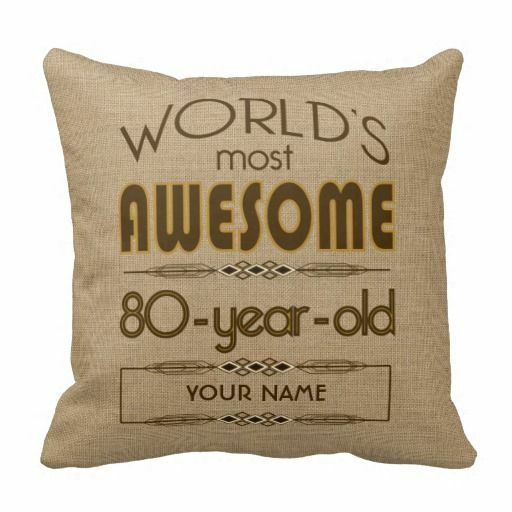 Zazzle is my top pick for 80th birthday shirts. They have literally hundreds of 80th birthday shirts in different styles. Personalized with the family name, it features up to 5 unforgettable dates with optional captions to distinguish a wedding date, first home, birth dates and more. Quality produced onto artist canvas, it arrives gallery wrapped to be proudly displayed in his home where it’s sure to be noticed and admired. 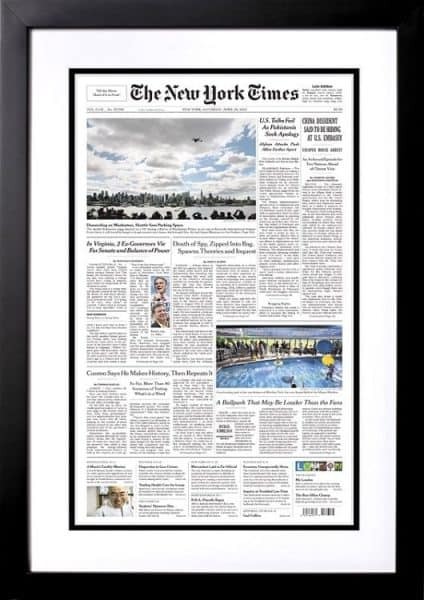 This custom-printed reproduction of the New York Times front page from the day he was born is the perfect gift to mark Dad’s milestone birthday. Available framed or unframed in 3 sizes, each reprint comes with a certificate of authenticity. Another great birthday gift for the Dad who has everything! An inexpensive gift that Dad is sure to enjoy! 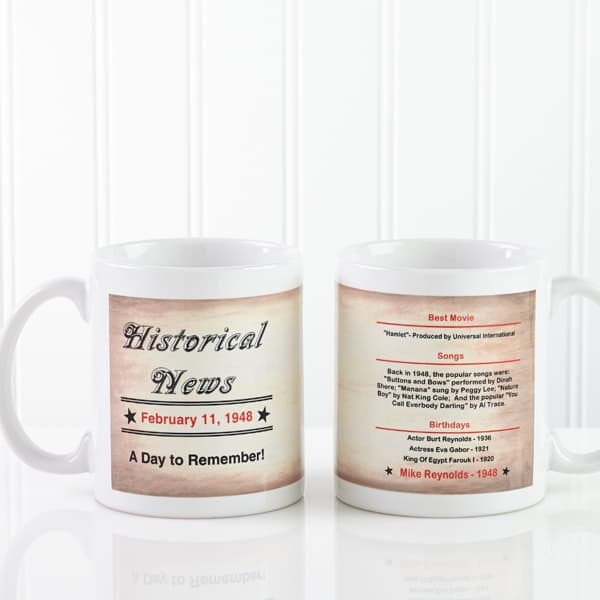 Handsome mug features Dad’s birth date and 1 line of personalization on the front. The back showcases his name, the top movies and songs from the year he was born, and the names of celebrities who share Dad’s birthday. A great last minute gift – it can arrive in just 2 days. 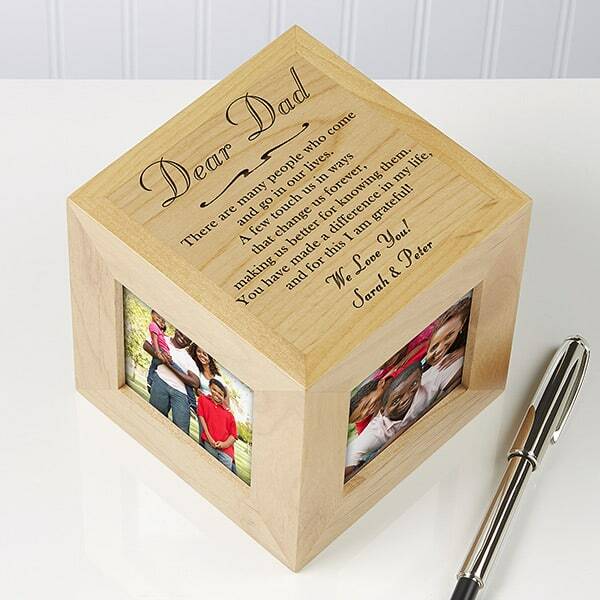 Quality crafted from wood grain, this picture cube features photos on all sides and a heartfelt message on top, so Dad can feel the love from every angle. Personalized with any title and closing sentiment, this gift lets you choose from 4 charming verses to express your love, or you can create your own heartfelt message. 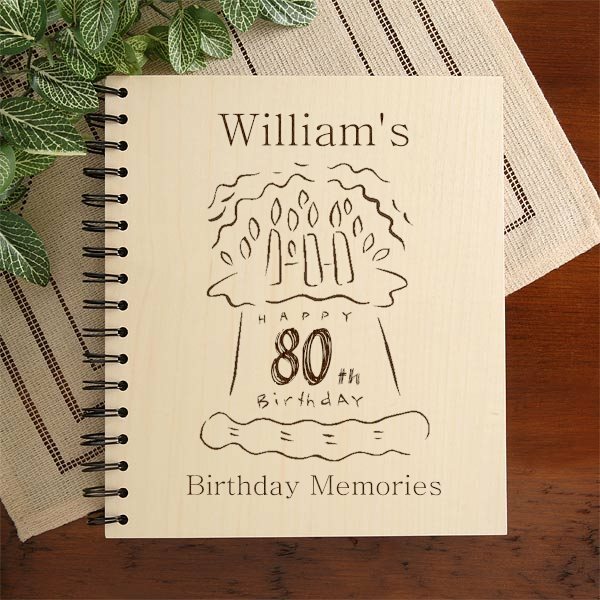 Fill it with his favorite memories to stylishly showcase your appreciation for 80 years of unforgettable moments. As a practical gift for the dad who enjoys the occasional cigar, this quality cigar cutter is crafted of stainless steel and includes 2 rings for precise and safe cutting. For that extra special touch, it also comes personalized with his initials. 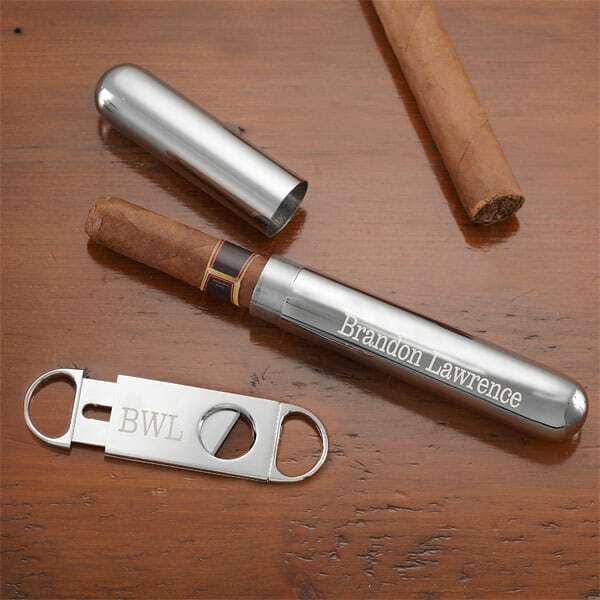 Combine it with a professionally engraved cigar case that fits perfectly inside his pocket, protecting his favorite cigar until he’s ready to enjoy it. 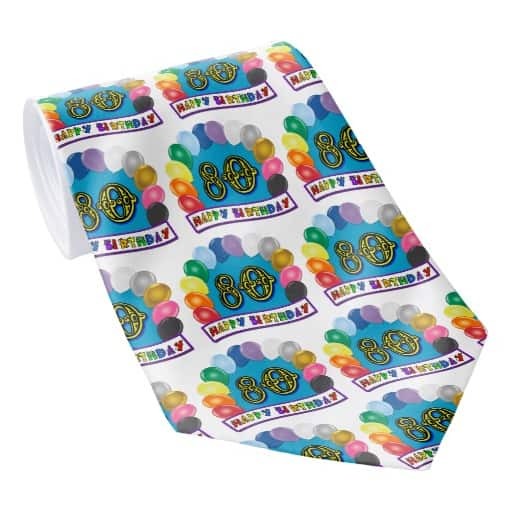 Featuring brilliantly colored messages, these fun birthday ties provide you with a slew of options to celebrate his milestone birthday in a stylish way. You can choose from hundreds of clever designs or create your very own using personal photos, patterns and quotes. Whether you choose a sidesplitting saying or a tenderhearted sentiment, each design features a silky finish, which creates the finishing touch for any outfit. 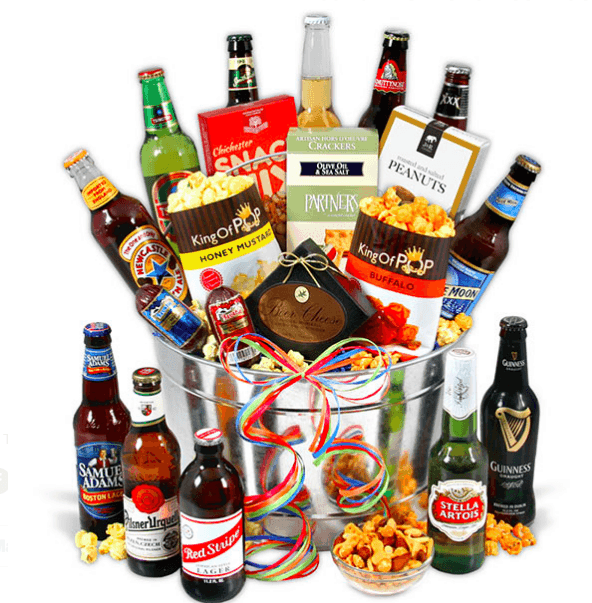 Impress Dad on his big day with this substantial beer gift basket! A full dozen carefully-curated international beers are artfully arranged in a galvanized steel bucket. 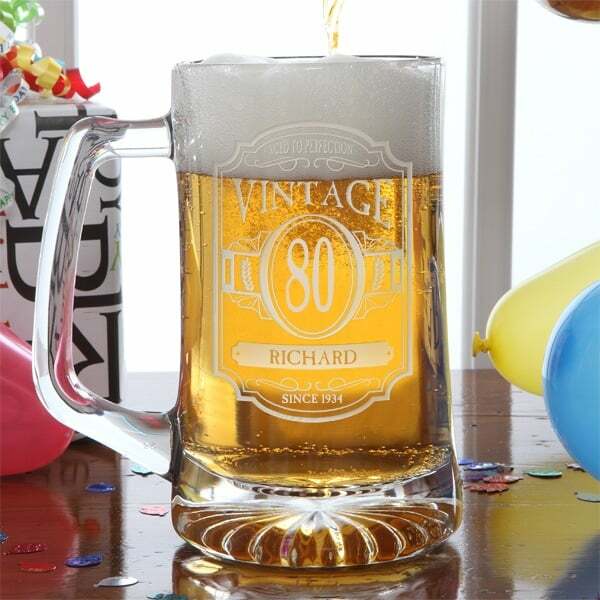 Gourmet snacks are added to create a memorable 80th birthday gift for the Dad who loves beer!